Green Topics - How to Go Green: Pour Rubber Mulch for your Landscaping Needs! Pour Rubber Mulch for your Landscaping Needs! Mulching is a highly beneficial process for gardeners. It not only helps preserve the life and health of the plants, but it also saves the gardener time and energy in maintaining the garden. Mulching slows the process of weed growth so the gardener can avoid heavy regular weeding. It also allows moisture to remain in the soil for longer periods of time which helps the plants grow and thrive. Wood mulch can be carried away by wind and rain. Rubber mulch does not decompose like wood chips. Essentially a permanent mulch, these recycled tire fragments have the added benefit of not floating. Stormy days with heavy rains will not dislodge the rubber mulch, while wood chips may float away. If your area is frequently wet, you do not need to worry about mulch rot. 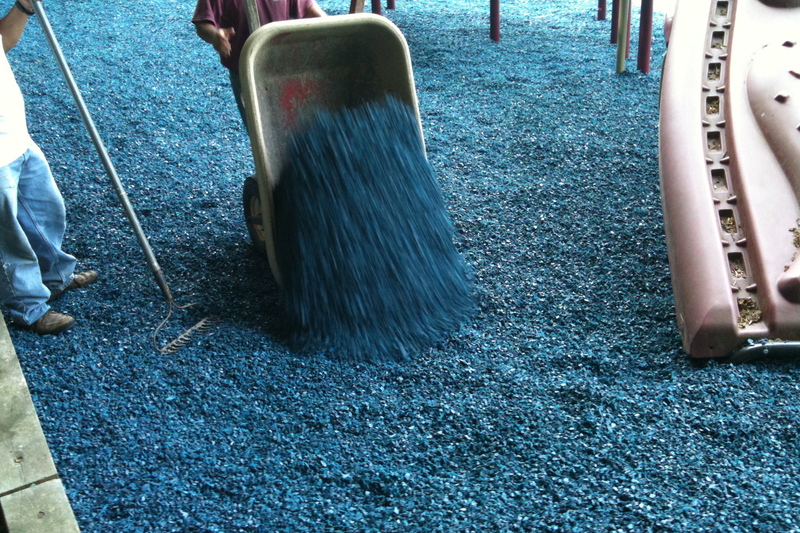 Rubber mulch does not rot and withstands the test of time as a protective soil layer. The thought of using rubber mulch may seem unappealing from an aesthetic perspective, but actuality it looks very similar to the wood mulch. Exposure to sun will fade the wood mulch faster than the rubber, but both will eventually fade over time. Rubber mulch also has a tendency to last longer through the elements. Rubber mulch can fit any shape you want! As far as effectiveness is concerned, both wood and rubber mulch will do the job well. The advantage of rubber mulch over wood is the staying power, ability to weather the elements better, the need to use less of the product and less need of replacing it over time. The disadvantage is cost, but this may be offset by the ability to use less and have it last longer. 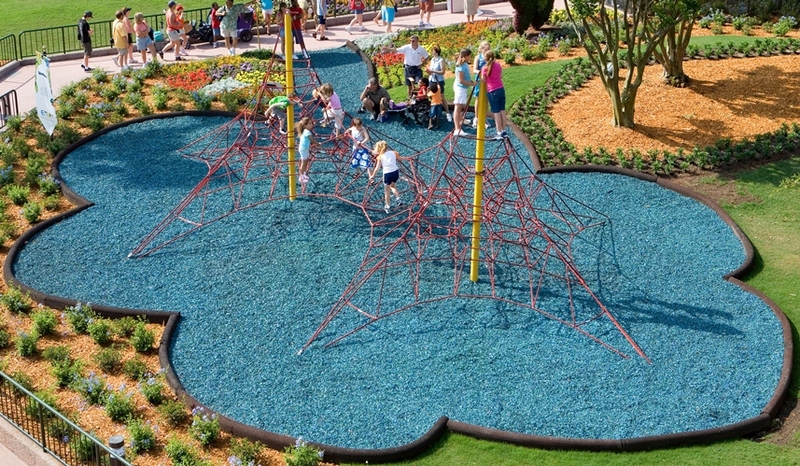 It is possible to obtain LEED benefits from rubber mulch as well, with points possible from water efficiency and sustainable sites, making it the perfect solution to large landscaping projects like parks and universities. for those interested in a rubber mulch solution. Pour in Place or PIP allows the user to prepare and pour their rubber mulch at the jobsite. The Pour in Place rubber mulch solution is easy to do once you get the hang of it but it can be a bit messy. (If your job is in Florida or Georgia we can quote you on pouring the mulch job for you). Basically there is the bagged mulch(comes in a 60lb bag) and the binder that adheres the mulch together. Generally 1 pail of binder allows for pouring 72 sq ft of bagged material for a smaller job. If it's a larger job then contact us and we'll quote the job for you. The big advantage of the pour in place is that you can really do a job with any size or dimension. If you have 3 trees in a small area and a traditional mulch tree ring will not do the job pour in place is your solution. If you are the landscape manager of a large school campus or strip mall or city or county and there are some non traditional planters, pour in place will help. Concluding, Rubber mulch is long lasting, has environmental benefits in that it is giving a previously manufactured product, a tire, another life and prevents the destruction of trees to produce normal wood-based mulch. 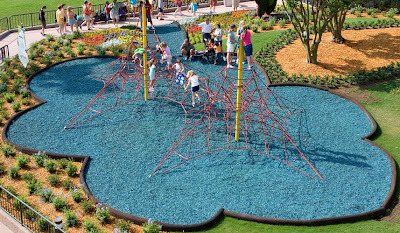 Bonded Pour in place rubber mulch is easy to use and comes in a variety of colors.